Green technology increasingly makes it possible to save a lot of money on your utility bills each year. Installing solar or renewable wind energy to your home, allow you to save hundreds or even thousands of dollars each year, and in the process will allow you to reduce your impact on the earth. This can be done, not just with solar and wind energy, but also by installing a wood or pellet burning stove, boiler or furnace. We also offer heat recovery ventilators that will improve indoor air quality without you losing any heat or cooling during the ventilation process. Solar panels are more affordable than ever and with a steadily increasing efficiency rating for absorbing sunlight, they pay for themselves much faster than they once did. Choose a solar heating solution for your Southern Vermont or New Hampshire home – hire the professionals at HB Energy Solutions for installation services. We also install solar water heaters for whole–home efficiency upgrades. Between solar panels providing a supplement to your electric consumption, and an energy audit that will pinpoint various ways to reduce consumption around your home or office, our solar and renewable technology services will save you a lot of money. Call the solar power experts at HB Energy Solutions today! HB Energy Solutions is a USA Solar Store. USA Solar is a buying coop of independent solar contractors and installers. We have licensed electricians on staff to complete your installation without having to hire any other subcontractors. This allows us to complete the entire installation on time and on budget. BPI energy audits to determine overall energy use and efficiency. Free estimates and a complete design for a customized fit to your needs. Engineering of customized support systems to conform to your installation requirements. HB Energy Solutions is looking toward the future and is proud to offer products for solar thermal energy. 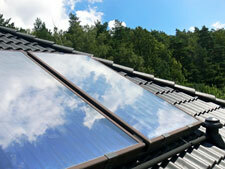 Solar thermal energy can provide hot water and even heat your home with the power of the sun. Solar and wind are the two energy sources that will last forever.